CUTTING CORNERS. Understanding the limitations of your car can go a long way in ensuring your prolonged safety on the road. Introduced and backed by the Ford Motor Company Fund, DSFL is a road safety campaign launched in SA in 2010. The Ford Motor Company of South Africa (FMCSA) believes its responsibility to customers should go beyond merely handing over the keys to a new car. Through its Driving Skills for Life (DSFL) training programme, FMCSA continues to raise awareness regarding road safety and to date almost 4 000 drivers have benefitted from the initiative, which is also offered in Nigeria, Angola, Kenya, Uganda, Zambia, Zimbabwe and Madagascar. “It is well known that South Africa has one of the world’s highest number of traffic accidents, injuries and fatalities, with the Automobile Association highlighting that over 14 000 people die on our roads each year,” says Neale Hill, FMCSA managing director. 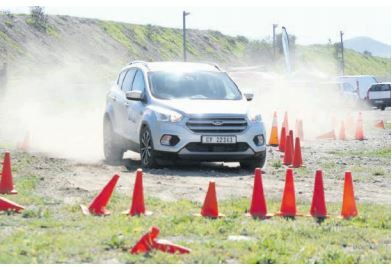 “Through DSFL, in association with our participating media and industry partners, we are continually striving to create a far better understanding and awareness among the motoring public regarding road safety. “Everyone needs to become more responsible and play their part in reducing the number of lives lost each year,” Hill said. Derek Kirkby, training director for MasterDrive which runs the DSFL programme for Ford in the region, said: “With DSFL, we provide a crucial step in the learning process, providing new skills and information that isn’t shared with newly licensed drivers in basic driver education courses. “DSFL addresses the inexperience factor and helps new as well as existing drivers improve their skills in the key areas that are critical factors in more than 60% of vehicle crashes. One of the leading causes of collisions is drunk driving, which has a dramatic impact on the driver’s concentration, awareness, depth perception and peripheral vision, reaction times and reflexes. To prove the point, the DSFL team uses goggles that simulate the dramatic effects of driving under the influence of alcohol. Additionally, a specially developed drug suit demonstrates the impact drugs have on the driver’s abilities behind the wheel. Using a cellphone while driving has become one of the main contributors to traffic accidents, and the DSFL programme highlights the shocking reality of how texting while driving costs lives. Ford has also made an effort to address the high number of pedestrian deaths, having partnered with the Automobile Association (AA) through the #ISeeYou pedestrian safety and visibility campaign launched last year. Around 40% of road deaths are pedestrians and commuters. The #ISeeYou national campaign set out to educate 25 000 commuters and pedestrians about the importance of seeing and being seen on the road. The project gave 15 000 commuters high visibility reflective sashes to make them easier to see. The DSFL programme also includes an important eco-driving element that educates drivers on the most effective ways of reducing fuel consumption and emissions, while minimising running costs and the impact on the environment.